NuWaves’ experienced Mechanical Designers utilize SolidWorks, an industry leading mechanical CAD tool for 2D & 3D drawings, which allows the team to ensure that the mechanical design is optimized to fit within the smallest possible space for its smaller (size constrained) designs. This tool imports the physical size and position of the circuit card components from the Allegro Layout tool. Since size, weight and power (SWaP) are critical in a lot of applications, NuWaves understands the importance of miniaturization and makes that a key concern in any design. 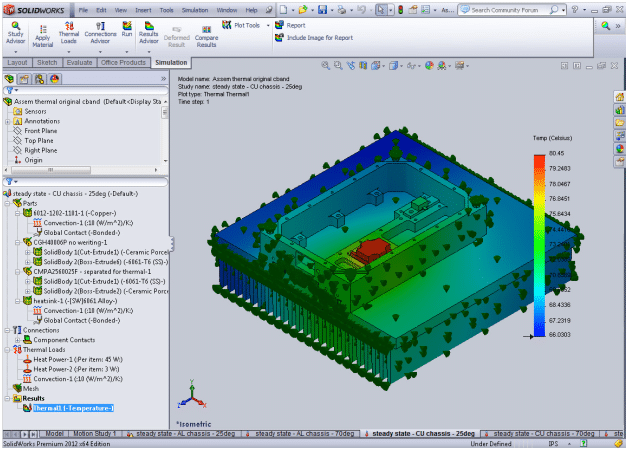 The mechanical suite also has an available 3D thermal analysis plug-in (SolidWork’s Thermal Simulator) which predicts heat flow and resulting temperatures as a function of the dissipated power of each of the components. As a result, our team can quickly transform any concept and generate production ready documentation for any product. In many cases, the mechanical design will also include RF shielding in addition to a complete shock and vibration study prior to hardware build. This early consideration of harsh environments allows NuWaves to provide quick-tempo and cost-effective solutions that will meet the ultimate requirements of the customer. Contact NuWaves when your next project requires Mechanical Design expertise.